It's been a couple of months since I joined in the Across the cafe table chat on the Travel Belles. Sometimes I can't think of anything much to write about concerning my travels and their posed questions. But this month I can definitely participate. July's discussion is about Festivals around the world. 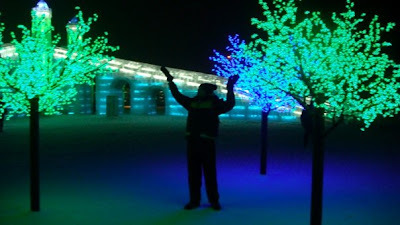 Korea is the home of festivals. There seems to be one a week; Cherry blossom, sunrises, masks, kimchi, fireflies, bull fighting, flowers, butterflies, green tea, rice, bamboo, sea parting... the list is pretty much endless. This weekend I will be indulging in the annual Boryeong Mud Festival. I went last year and it's a good laugh. Mostly attended by foreigners we spend the weekend, getting mud thrown over us, jumping about on bouncy castle style inflatables and sitting on the beach watching a fantastic firework display. This year I'm going along with the Mannam soccer team, who have organised an amazing schedule of events. I can't wait, even if it's going to pour with rain. That just adds to the fun! But... 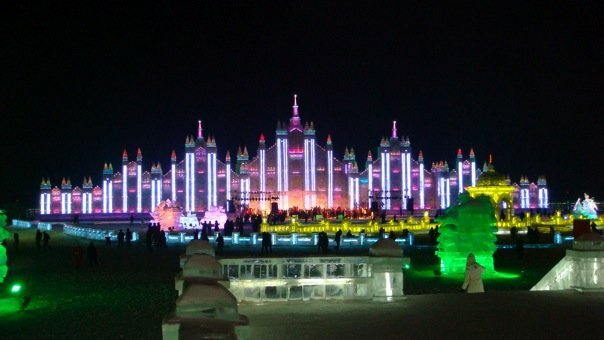 I think the most impressive festival I've ever been to was in China in 2009. 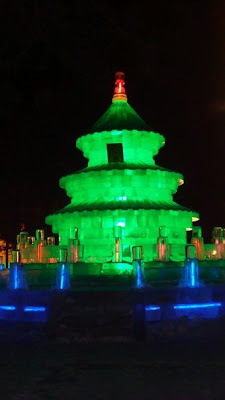 We had a month off of school during Spring Festival (Chinese New Year), which was the perfect time to head up north and see the Harbin Ice Festival. This is one of the most amazing things I've ever seen. 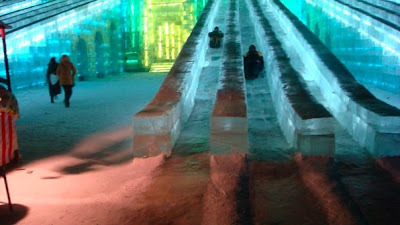 Harbin in winter is freezing. I mean -30oC freezing. The water vapour in your nose freezes as you breathe in. It's that cold! 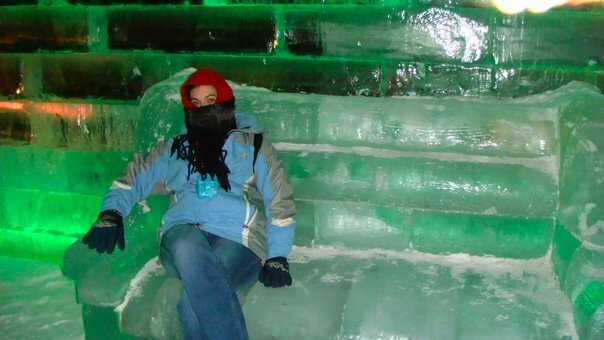 We had 3 layers of clothing on and could still only stand it for a couple of hours before we had to make a dash to the nearest coffee shop (of which Harbin is sorely lacking!). 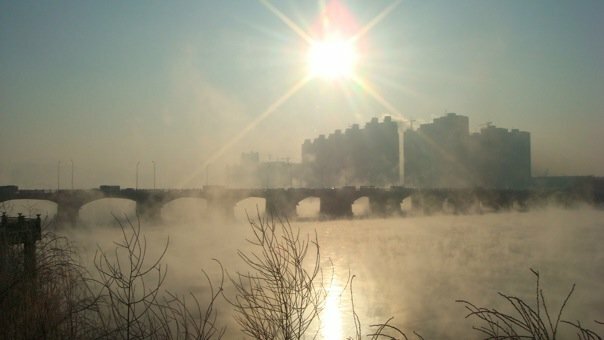 In Harbin there is a huge river, that in winter freezes completely. So much so that you can take horse drawn carriages across to the other side. 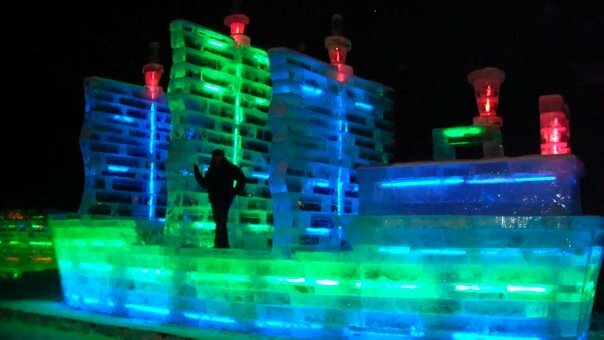 Across the river from the city is the park where the ice sculptures spend the month or so of the festival. The sculptures are fantastic. Firstly, they are huge. There are castles, buildings and boats as well as large scale domino or Chinese chess boards. Secondly, they are fun! It's busy so we queued for a long time (fingers and toes going numb) to slide down a huge toboggan run (of which a large pile of snow is the stopping point.) Then we warmed our hands on hot chocolate in a small chalet style cafe. There was a smaller festival in Jillin, a city nearby Harbin which was also very impressive even though it was on a much smaller scale. Harbin is an experience I will never forget. One of the best of my travelling days so far. If you ever get a chance to go, I recommend you take it!